Hicks has commented that capital is like a building, and ‘though it is the same building, it looks quite different from different angles’ [38 p. v]. As a direct example, consider the question: ‘What is your capital?’ You might say, ‘my bank account’, or ‘my house’, or ‘my factory’, or even ‘all the goods and services that I possess, including myself, which yield me useful services’. 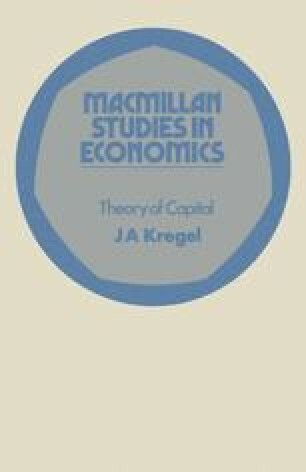 Now if you were also asked: ‘How much capital do you have?’, the corresponding responses might be: ‘£100–89’, or ‘the amount I’d get from selling my house’, or ‘the cost of the factory’ (or ‘the present value of the discounted future profits expected from operating the factory’) and finally, ‘the discounted value of the expected future services of my possessions’.